i hope you will find the art work from these next few issues enjoyable (#18-21). this is the "brown paper bag series". 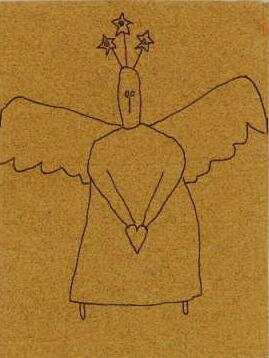 several members of primitive pals have agreed to have a sketch that they did on simple brown paper as the featured art for each of these newsletter issues. sketches are by: dan dipalo (fried green tomatoes), gloria bowlin (the crow and the weasel), shari lutz (shari's creations of old),sonja sandell (hickety pickety),and me. my sincere thanks to these folks for allowing their work to be displayed (credits are listed for each on the main index page).
" I have been so busy that I haven't had time to write anything. I just finished with making a doll for a local celebrity . I was asked to make her something to give her for speaking at our local high school. Suggestion made was 'make her a t-shirt' and I thought a doll would be more memorable. I made her a weather angel with wings out of a weather map cut of the local newspaper, enlarged and put between two pieces of iron on vinyl. Her dress front was four pieces with appliqués of each different season on them. She held in her hands the "trade secrets" of every good weather woman, a groundhog, woolly worms, persimmon seed sack, owl (for hooty hoo day, to scare away winter) and if all else fails a crystal ball. She was very happy to receive her and I have no doubt that this doll will be loved and cared for. I had such a great time making her!" "just want to let everyone know, after a long hard day at work, i came home to a very pleasant surprise in my mailbox: her name is flora rose and she comes from june in australia. her muslin dress is adorned with embroidered flowers and buttons (there are even some on her pantaloons). she has braided hair and a very pretty piece of lace around her neck. her wings are wood and crackled. june did a great job and i will cherish my angel from down-under. can't wait to show her off to my doll club - and of course, find a very special place for her in my home." " I'm working on my santa exchange and I realized he's to pretty. I am not quite used to primitives ( porcelain dolls are my first love) so I took a Styrofoam egg wrapped it in quilt batting gave him a nose that I tried to sculpt and now he's down right ugly and he'd scare a child to death. Are primitives supposed to be ugly? I sure hope my partner isn't disappointed. This is my first exchange and after feedback on these two nobody will probably want to exchange with me! After doing pretty dolls, primitives are so hard........ I did find some pieced together fabric that looks like old quilt and will start my second santa with this. " and these are from joanie: when your family has to ASK if they can drink from the pot of coffee that's on. when the inside of your dryer has a brownish tinge to it. when your laundry hanging outside looks dirty. when you actually bleach something to get the color OUT so you can STAIN it. when you have to apologize for something not being dirty and tattered ENOUGH!!! when someone tells you the item you are buying is ripped or stained and you say "that's OKAY". when garbage picking becomes a "fine art"
replies to karen's comment about why people are calling their primitives "beautiful"
"2 more questions for the list. I have some older burlap pieces that I bought to make Christmas stockings a few (about 7) years ago. They are ivory, blue & pink. Do you think these colors could be used in primitives? I could tea dye the ivory, I guess. And, has anyone tried to use a cranberry tea to dye muslin? I was thinking the other day that this might give it an antique pink or very old, kind of dirty look. I haven't tried it yet. I was looking at the herbal teas & this looked like the only one that I thought might have some color. I am not sure if the apple/cinnamon tea would be a nice brown or not. " " I'm partial to angels, but I've been hearing mutterings at the Doll Club lately about being "angeled out" - do you think that they are a passing fad, or are they here to stay? I certainly hope the latter!" "I used muslin with voile over the top - I stitched them both together and cross stitched the hem in gold. I then made coffee and put it in a spray bottle and let her have it. I also dunked the body yellow with some charcoal (I dyed some mohair for a bear) thrown in, so it kind of looks moldy. The angel also "flew" through a mist of gold spray paint a few times. I made one for myself as well and I am pretty pleased with it."